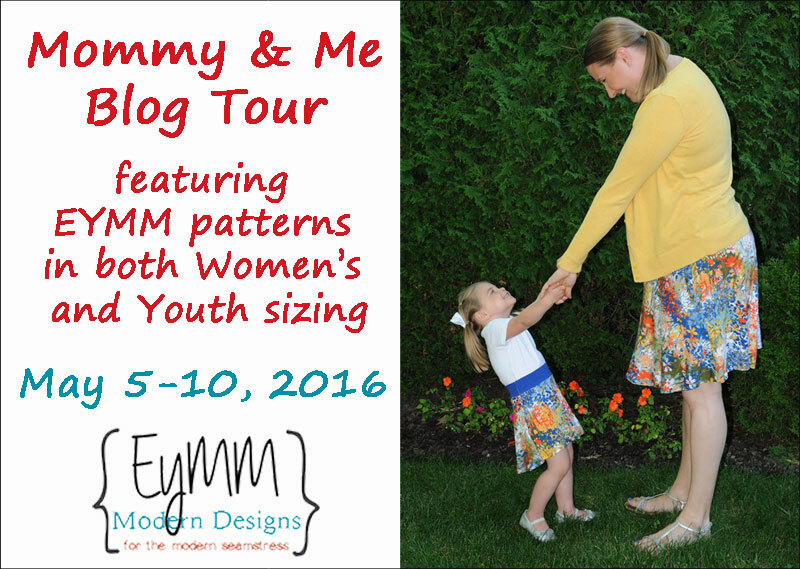 With Mother’s Day coming this weekend, I thought it’d be fun to join the Mommy & Me tour for EYMM! This post contains affiliate links, but all opinions are mine. The shape of both the women’s and girl’s Calla Lily Skirts *(affiliate link) are perfect for summer. The high/low hemline gives it style, but there’s plenty of room in back to bend over or twirl without the skirt slipping up. Speaking of bending over, the girl’s version has a skort option which is perfect! Bean was so excited that her shorties matched her skirt. The crossover in the front is pretty, but what I really love is how the back billows out when you walk. I can’t wait to see Bean in this skirt running around the back yard this summer. The women’s Calla Lily *(affiliate link) has the same shape and is just as nice. These sew together incredibly quickly so you can have a new skirt made up in no time. Though the rest of my body was blurry or chopped off, Bean did a pretty good job of getting the skirt in the pics, hehe. Of course she was directing me to stand in very specific ways…. hence the toe pointing. You can buy both of the patterns together as a bundle to here *(affiliate link). And this is what happens when she asks to take a “nice picture together.” I should have known there would be silly faces! During the tour, all Mommy & Me Bundles are on sale! Use coupon code MOMMYANDME2016 on the EYMM site *(affiliate link) to save 25% on any Women and Youth Size Pattern Bundles *(affiliate link) until May 10 at 11:59pm PST (note: build your own bundles are excluded from this sale).